Yesterday’s discussion explored women’s activism in Central America and the Caribbean; today’s post will look at women in South America; and tomorrow we will see how women in North America combat injustice and inequality. Together, Mexico, Central America and South America make up what is commonly referred to as Latin America, with Brazil being the only non-Spanish-speaking country included in this grouping. 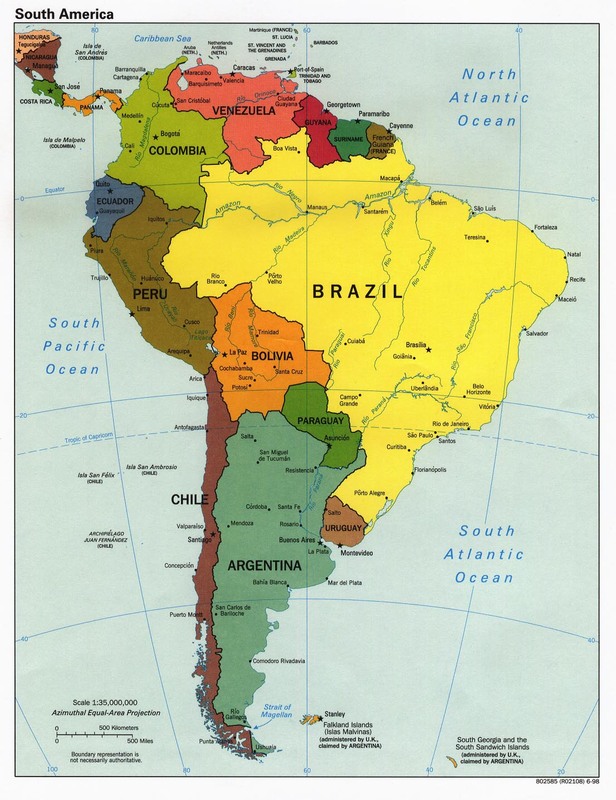 South America also includes three areas that are not historically “Latin,” Suriname where Dutch is the official language, English-speaking Guyana, and French Guiana which is an overseas territory of France. Every nation in South America has a history of indigenous peoples and conquest. Today we will learn how women on this continent fight for their human rights. Colombia: In one of the countries with the most internally displaced people in the world, civil war has raged since the 1960s and women participate in every group in Colombia, violent or not. 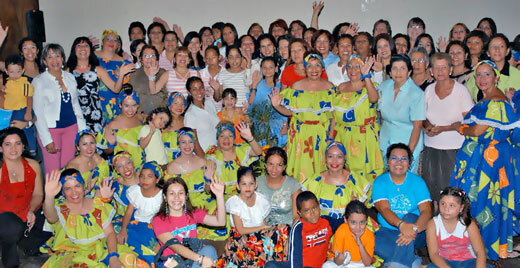 Ruta Pacifica is one women’s group working for peace. Women’s voices are often silenced when they protest for peace or human rights, by both left- and right-wing guerilla forces and sometimes even the government, all of whom use sexual violence to intimidate. Sadly, violence against women, especially women protesters, has escalated to assassinations in Colombia. Unionists, and journalists are also frequent targets of violence in Columbia. Venezuela: Venezuela’s controversial president, Hugo Chavez, has many supporters, and dissenters, among women but the Venezeulan bourgeoise that thrives on the misogyny of the beauty industry is among his most virulent opponents. Sadly, for a country with one of the most gender-competent constitutions in the world, there are only two women’s shelters. In any case, the country’s capital, Caracas, hosted this year’s Global Grassroots Women’s Conference to mark the 100th anniversary of International Women’s Day. These articles offer a balanced insight into the reality of life for ordinary Venezeulans. Guyana: While Guyana has had a female president, politics in the country are still very male dominated. In honor of International Women’s Day Guyana’s Prime Minister addressed some of the obstacles women there face in achieving gender equality. This piece chronicles some of the important milestones of women’s rights in Guyana. Brazil: Even though women in Brazil are not well represented in politics, November 2010 saw Brazil elect it’s first female President, but her candidacy and the race to the election was not without controversy over reproductive and social justice issues. Women’s groups in Brazil, possibly drawing inspiration from their newly elected President, are coming to understand the importance of organization and activism across all spectrums. Afro-Latina feminist activism in Brazil has deep roots that continue to inspire women there to fight for their rights, and disabled women activists in Brazil continue to fight for visibility and mobility there. Peru: The quota systems in place to include women in government in Peru have proven to be ineffective, with women elected as puppets for male politicians. On the other hand, women in Peru are proving to be vital to ensuring the genetic biodiversity of the country’s food supply and protecting the country’s environment. Indigenous people in Peru have been the driving force behind holding everyone accountable for their environmental impact. Sadly, women’s bodily integrity has been a major issue in Peru, with women fearing for their safety if they bike to work, a number of women being sterilized against their will and women resulting to a national hotline for how to self-induce abortion because it is illegal there. This hip-hop artist is single-handedly taking on racism against the many varied peoples of Peru, and sexism through her music. One young Canadian woman tells her story of Peru here. Bolivia: 28% of Bolivia’s parliament seats are filled by women and half of President Evo Morales’s cabinet is women. Despite widespread violence against women (only in 2010 did the legal sentence for murdering a women finally equal the sentence for murdering a man!) 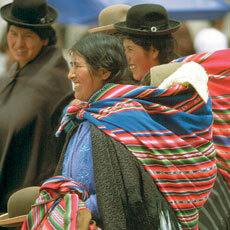 and particular hardships for rural women, Bolivia’s President (oh how I love feminist men!) has pushed for gender equality and women’s land ownership. On International Women’s Day activist Maria Galindo was arrested for spray painting “No quiero ser la madre de Dios, de ese Dios blanco, civilizado, y conquistador” (I don’t want to be the mother of God, of this [masculine] white, civilized, and conquering God.) Go here for an academic analysis of the patriarchy of Bolivia. Chile: The current leader of UNWomen, former Chilean President Michele Bachelet’s election in 2006 was a sign of hope for the women of Chile. In February of 2010 a massive earthquake struck Chile, and women were as much a part of the recovery process as they were victims of the tragedy. After the earthquake the government hired thousands of people to help rebuild and restore normalcy, but now the government says there is no room in the budget for these jobs. To demand the government continue to employ people to help in the earthquake recovery process 33 women in Chile have occupied a non-operational mine and are staging a hunger strike. Other activism takes place to combat forcible sterilization of HIV+ women and support feminist theology and women’s roles in spirituality. Uruguay: La Maleta Roja (the Red Suitcase) is an organization in Uruguay that helps liberate women’s sexuality. Other women, including activist Maria Esther Gatti de Islas, have helped liberate political dissenters from government-forced disappearances. The Instituto Nacional de las Muejeres and Cotidiano Mujer are following in Gatti’s footsteps and continue to fight for women’s rights in Uruguay. Argentina: Uruguayan activist Gatti also worked closely with the Madres de Plaza de Mayo and Argentina to fight for the rights of los desaparecidos. In July, 2010 Argentina became the first country in Latin America and the only country in the Western Hemisphere, besides Canada, to recognize marriage equality. The activist group Las Juanas is hoping to incite the writ of Habeus Corpus to legalize abortion in Argentina and also fights against femicides. Some activists have been attacked for merely starting discussions about contraception and abortion. Other activists fight against human trafficking, showing that the situation for women in Argentina needs improvement but the women there are not afraid to take on that work. This entry was posted on Sunday, March 13th, 2011 at 21:01	and tagged with Activism, Argentina, Bolivia, Brazil, Chile, COlombia, Guyana, Peru, South America, Uruguay, Venezuela, Women's History Month, Women's rights and posted in Race/Ethnicity and Activism. You can follow any responses to this entry through the RSS 2.0 feed.